Greenkill Avenue Bridge Replacement – KC Engineering and Land Surveying, P.C. 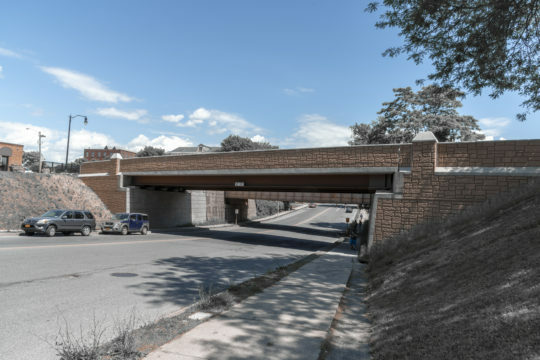 KC provided engineering design services for the replacement of the Greenkill Avenue Bridge over Broadway in the City of Kingston, NY. This project consisted of the removal and replacement of the existing single-span through-girder bridge. KC provided base mapping for design assessment and used MicroStation InRoads software to provide digital mapping and DTM. Archival as-built utility mapping, as well as location of on-site markout, was incorporated into base mapping. In addition to engineering design services, KC provided survey work that consisted of Broadway, Greenkill Avenue, and CSX Railroad right-of-ways, as well as the adjoining commercial and residential parcels. KC provided base mapping for design assessment for rehabilitation and replacement of a dual-purpose street and the railroad bridge over Broadway, networked GPS observations performed to establish SPC coordinates and on-site benchmarks in NAVD 88 datum, and researched recovery of monumentation and resolution of railroad, private parcels, and easements of record.